A cord of wood refers to a stacked pile of wood measuring 4 by 4 by 8 feet. This is a standard measure originates from colonial times 4 feet being the practical size loggers and farmers could handle when carrying firewood. The firewood was then stacked 8 feet high as this was the amount the horses could haul. When measuring a cord of firewood, it is assumed that the wood is neatly arranged such that the individual pieces of wood are stacked together to fit a space of 128 cubic feet which is equivalent to 3.62 squared. Although a full cord of wood occupies a volume of 128cubic feet, the actual volume is actually about 90 cubic feet. The other space is taken up by the air between the individual logs or pieces of wood. The amount of the wood in a given cord will vary depending on the size of the individual pieces of logs in the cord. If the logs are larger in size, they will usually be fewer than if the logs are smaller having been split into smaller sizes. A full cord can weigh approximately 5000 lbs. if it is hardwood and approximately 2500 lbs. If the wood is harvested from softwood trees but regardless of whether the wood is softwood or hardwood, a full cord of wood usually fits into a long bed pick-up truck with racks. However, even with this in mind, buying firewood can still be very confusing. This is because; most dealers or supplies rarely sell firewood for home heating using this official standard of measurement. Some firewood sellers often sell wood in smaller pieces with lengths less than four feet. Below are some of the terms loosely used by firewood dealers when selling wood in cords. Apart from the full cord, this is one of the most commonly used measurements used by firewood suppliers. A face cord is a stack of wood measuring 4 by 8 feet but the lengths of the individual pieces of logs or wood are less than four feet on often measure 16 inches long. This is usually a third of a cord width. 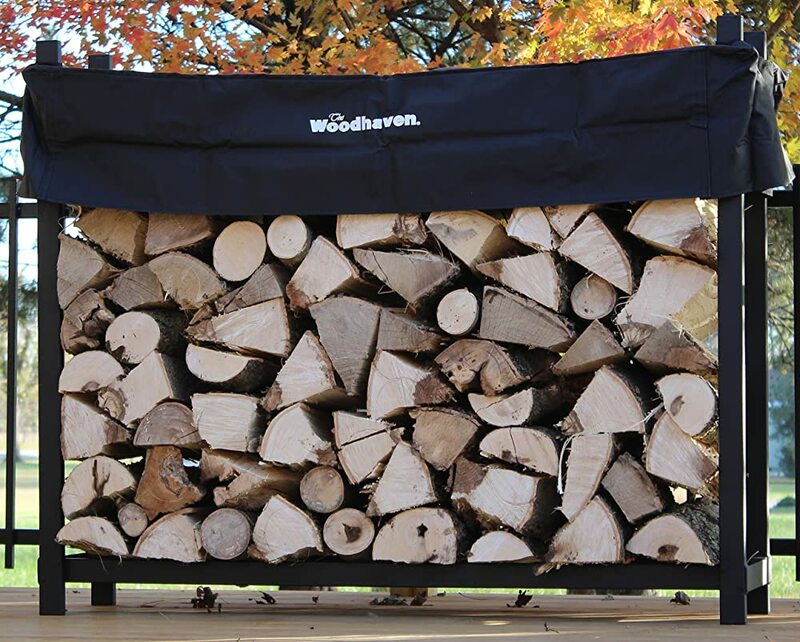 A stove cord, a furnace cord and pick-up truck loads are some of the terms used by many firewood dealers and suppliers. All of these measurements are not official standards of measurement and are therefore not legally recognized. 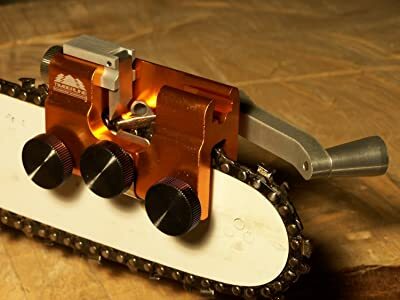 Buying firewood using any other measurements than a full cord is tricky and should be avoided as much as possible because unscrupulous dealers can use them to short change you by inflating prices or simply delivering less than what was ordered. It is also illegal in many states irrespective of whether or not the buyer (you) agree to it or not. There is no standard or specific price for a cord of wood. The prices fluctuate as often as the price of fuel depending on many factors. However, the average price ranges between $250 and $500 depending on the type of wood, if and how the wood was seasoned and the prevailing circumstances. 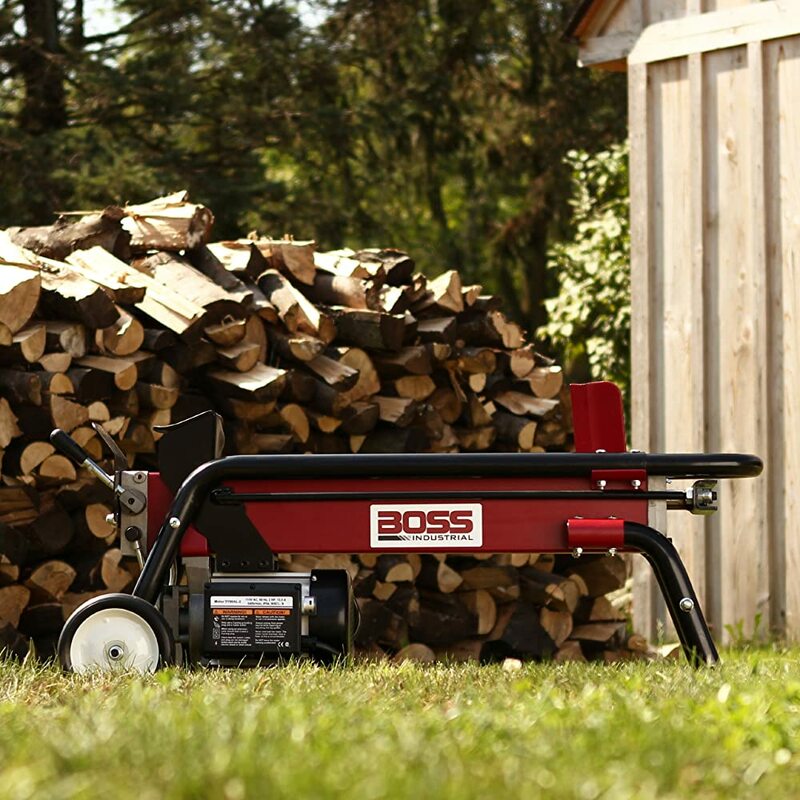 Below are some of the factors that often influence the price of firewood. There are two broad types of wood: Hardwood and Softwood. Hardwood firewood burns hotter, for longer, are denser and produces less smoke than softwood. Some of the hardwood species are maple, beech, walnut, birch, oak, dogwood, almond, alder, pecan, birch, etc. On the other hand, softwoods are cheaper, but heat up faster and burn out more quickly at the same time. At times softwood produces a considerable amount of smoke too. Examples of softwood include red cedar, spruce, larch, juniper, pine, and balsam. To distinguish between the two, hold either in one hand and feel the weight. The heavier one is the hardwood. Alternatively, check for the number of rings on the cut part. More significant and broader rings mainly characterize softwoods. Of late, there is another type of firewood introduced into the market. These are the blended firewood. Manufacturing of the wood aims at increasing ease of ignition and burning duration. Fire enhancers such as natural waxes are added to achieve these properties. An example is Duraflame. During extremely cold winters, people use more firewood for heating. During such periods demands is often higher than supply and hence the cost of firewood also escalates. The earlier you buy, your firewood, the more you will save. If you do not buy early, you may end up falling victim to exorbitant prices and even missing out on the best firewood. You may also run out. If the dealer is delivering the firewood for you, then the cord of the firewood will definitely cost you more. However, this is always the best alternative because it is the only way to guarantee that you get exactly what you ordered. You will be able to measure the size and volume of the cord or cords of wood before paying for it. Depending on your location, you may need to pay between $ 20 and even $100 for delivery and having the supplier stack the wood for you. Most dealers sell shorter lengths of a full cord of wood more expensively than larger logs. This is because such firewood has been cut more in smaller pieces and handled a lot more than larger logs. The firewood is hence more convenient to use because the supplier has put a lot of effort into preparing it for use. The more the effort or labor that has gone into the preparation of the firewood, the more expensive the price. How the wood was dried and the storage conditions will also influence the price of a cord of wood. 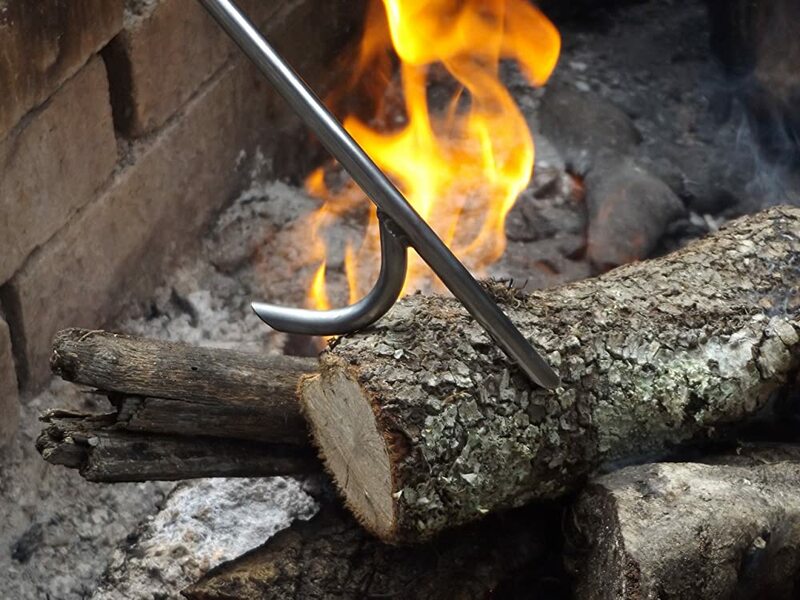 Such firewood is cleaner, drier and more pleasant to use because it does not contain mud or sand in the bark which would otherwise make it less pleasant to use. To see to it that you get the best deal for the money you are spending, you should be able to determine if the cord on sale is the right quantity. You always never know when a dealer might want to defraud you of your hard-earned money. This is the reason why we recommend that you do not buy a cord of wood online or by telephone but instead visit the place physically. Before taking the measurements of a pile of wood, ensure the stack has square corners and straight sides. An uneven stack requires estimation of the measurements which might give you inaccurate final results. Taking the measurements will need a tape measure or any instruments for measuring lengths. The length of the cord is the longest side. First of all, the edges are straight for ease of measurements. Then, using the tape measure or a yardstick, measure the whole length from the point the stack starts to the end. There are instances where one of the ends will be sloping and not vertically aligned. When this is the case, you have to estimate where to start measuring from and where to end. Note the value you get. It should be about 8 feet long. The height of a cord of wood is the average vertical elevation of the stack throughout the length. At times, the height is different at various points along its length. Take the different heights then find an average. It should be around 4 feet high. Measuring the width can be a little hard if the individual pieces of wood vary in length. It is so because it is these pieces which determine the overall width of any stacked pieces of wood. In such a case, just like the height measurement, take several widths and then work out the average. After taking all the length, height and width measurements, find the volume of the stack by multiplying the three (L x W x H). This value should be 128 cubic feet for a standard cord of wood. However, there are stacks of wood larger or smaller than the dimensions of a cord. In this case, measure all the three dimensions and then find the volume of the whole pile of wood. After finding the volume, divide this by 128 cubic feet which is the volume of a cord. The figure you get gives you how many cords are there in the stack of wood. For example, if the volume is 64 cubic feet, dividing it by 128 cubic feet gives you ½ a cord of wood. Before measuring a cord of wood, neatly arrange the pieces of wood. A loosely packed wood has too much air spaces in between the wood, and these air spaces will result in inaccurate measurements. If re-arranging the wood is impossible, then there is an estimated volume of such loose cords. The estimate given is about 180 cubic feet and takes into account the volume occupied by the air between pieces of wood. So, work out the whole volume of the stack, then divide it by the 180 to find out how many cords of wood are in there. It is worth noting that 180 is a very rough estimate and does not take into account how loosely the stack is. When using it, expect the outcome to be a little off from the actual measurements. It is no secret that countless homeowners depend on firewood for heating their homes year in, year out. That is why the firewood topic is an essential one. This is because without it, the cold would become too unbearable more so during winter. Since the demand and supply of wood are somehow a seasonal one, the pricing also fluctuates throughout the year just like the price of gas. Apart from the product demand and supply, other factors affect the pricing too. It’s the reason there is never a fixed price on wood. There is a misconception that all wood is the same, no matter the place and country. However, this is not always the case. Wood quality varies from State (country) to State. The difference in growing conditions is what results in the different wood species we have currently. These distinct species result in the different burning properties of firewood. That is why some wood burns faster than others while others have higher heating values. Then there are those that produce more smoke than their counterparts. If you have asked around for firewood, you must have realized that the suppliers often use the term “cord” about a given amount of wood. It is the universal term used to quantify wood and dates back to the 1610s. As earlier mentioned, a cord is about 128 cubic feet of timber. Softwood and hardwood are the main types of firewood that you can find around. But, is there a difference between the two? Of course, there is. The costing and burning properties differ, meaning that you need to decide which wood to use between the two. As you compare the different prices, outline the requirements you want your wood to do for you. Additionally, between these two types, there is one that burns much better than the other. First up is hardwood. This type of wood is known to have slow burning properties, emits little to no smoke and produces few sparks when burning. Since they have more energy than softwood, the resulting flames tend to be hotter. Because of these advantages, hardwoods are known to be the most expensive of the two. On the other hand, softwood is your ideal choice if you want wood that heats up quickly and burns out too just as quickly. Softwood, unfortunately, has specific undesirable properties. It produces more smoke sparks excessively when burning and gets depleted quickly. On a positive note, softwood is cheaper to buy than hardwood because of their faster growth rates. Evidently, hardwood is the better of the two types under same dryness conditions and should always be your choice for home heating. Unless there is some other reason why you would insist on softwood, we recommend that you stick to hardwood fuel. Because of the price differences, if you find someone selling purported hardwood firewood at questionably low prices, then think twice. Such a deal might be too good to be true, and you might end up buying softwood instead. The reverse can also be true, where you unknowingly pay hefty prices thinking it is hardwood yet it’s all soft. Being able to tell the difference between the two is, therefore, key to a better deal. Softwood is mainly from coniferous trees with the needle-like leaves. At times, they are also straighter than hardwood and more straightforward to split. After settling on your wood type of choice, you need to have them transported home and stored under proper conditions. Firewood storage then becomes a task that you must do because it in a way determines how well the wood burns. Stacking is the best option if you have bought would already dry and split. The choice of the place you do the stacking should, first of all, be convenient to reach and be free of any moisture throughout storage. Preferably, use a location with some cover for protection against weather elements. The good thing with stacking is that you have endless styles to choose from. Doing a quick search online will reveal exciting choices for your consideration. The key is always having neat and well-organized pieces of wood because your guest might judge how organized you are. If the wood is not split and is still green or wet, then you have to split it into smaller pieces for ease of storage. After splitting, find an open place with good airflow in which you will stack the wood to air dry. Stacking methods affect how fast and efficiently split wood dries. Cross tying or row stacking are the most popular methods of efficiently stacking wet wood for a quicker rate of drying. 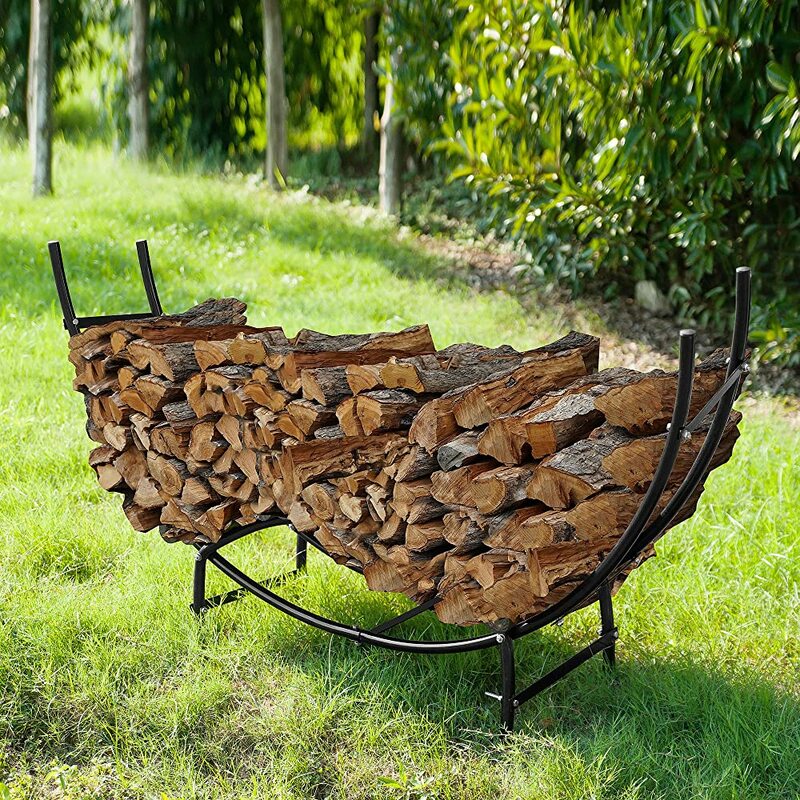 As you do so, use logs, bricks or pallets as the base of the wood stack on the ground. Let us give you a hint for reliable stacking. If you are doing the splitting yourself, strive to split the wood into rectangular or square pieces. The relatively regular ends make for stronger stacks as compared to round or oddly shaped parts. Otherwise, your stack of wood might tumble from time to time. It might take more effort to split them into the desired shapes, but it will be easier to cross tie the ends thus saving you valuable time in the process. In further efforts to save the time by continuously reorganizing fallen woodpiles and stacks, avoid stacking near trees. During windy conditions, trees shake, tipping over the wood as they do so. Find an open place, and then cover only the top of the pile so that air can freely flow between the pieces of wood. You need to have easy access to your storage location at all time as you will have to rotate the pieces to prevent rotting of the bottom rows. Any arrangement you decide on needs to be such that you can access the driest wood with ease. Burning green wood would produce too much smoke. For the utmost convenience, look for holders and racks for storing your wood either outdoors or in the house. It is worth remembering to keep wet wood outside as they do contribute to the overall humidity in the house. Only have firewood you need for the day, or the next day. Having excess wood in your house might create a breeding ground for pests and pollen. Wood barks are a nuisance too indoors. Finding a reputable wood seller with quality products can be a tricky affair. Reputation is vital so that you do not end up with firewood that can’t burn or if it does, then the smoke becomes too much. We recommend that you first start by asking friends and family. If that is not forthcoming, then turn to Google for recommendations. A simple search of the term “firewood” and your location will give you results of the dealers in your neighborhood. If you find some, go ahead and search for their reviews and see what prior clients say about their wood. Another option we would recommend is the use of the Better Business Bureau (BBB). Once there, type in your location and then search for “firewood” in the search box. The search yields all the businesses dealing with wood in your area. As a last option, I would recommend you use Craigslist. One of the problems with this option is that you have to be really interested in firewood to get the most notable results. As you store your wood, it would be worth remembering these tips for the longevity of your firewood. Splitting green wood increases its surface area exposed to air. In this way, the wood would dry up faster as opposed to when stored wholesomely. When in a rack or stacked, alternate the directions of the rows by 900. Some of the rows will face you; then the next row has the tips facing right to left. This arrangement creates air gaps between the pieces to hasten the rate at which they dry and improve stack stability. Ground moisture causes rotting of the firewood when left in contact for a long time. Give the wood some barrier such as pallets as the base of the stack. It also keeps away termites and borer insects. 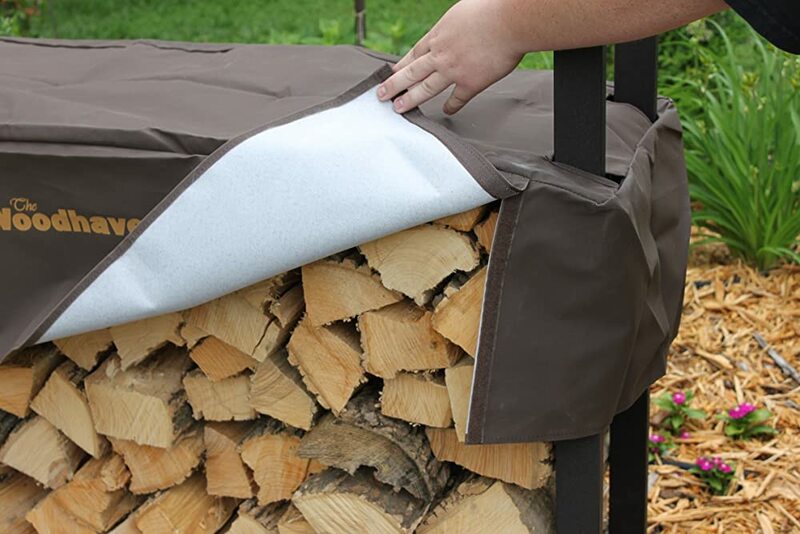 It is essential to keep away rain and snow from your firewood at all times. There is a debate, however, on how much cover to use for protection. On the one hand, it should be sufficient while on the other hand; airflow should be decent within the stack. I would recommend storing the wood in a shed to balance between the two requirements. Otherwise, you can use a tarp with good airflow. After making an order for the delivery of your wood, there are certain things you need to do right. You need every receipt and information about the seller either for future references or complaints in case they deliver you inferior quality wood. The seller’s legal name. If you did an online search, ensure the name matches what you found. Phone number and physical address of the seller or company you are dealing with. The date of the delivery. The price you are to pay plus the total volume of firewood delivered. These should be provided first before you pay as some unscrupulous sellers may decline to provide them if you pay first. If possible, use a moisture tester to determine the condition of the wood delivered. If you ordered for dry ones, the moisture content should be below 20%. Splitting your wood is a convenient way of customizing your firewood to the specifications you need. The lengths, thickness, and shapes can all be worked out in your backyard. Plus, DIY activities are a great way of spending your weekends. These are some of the tools you can use. Although there are numerous sellers who sell firewood, it would not be wise to just pick the first cord you see. Ensure that your dealer is a licensed and reputable dealer. To find the best dealers near you, you can simply check the better business bureau to check the reputations of the registered dealers in your state. After making an order, it is important to have the firewood delivered by the supplier. Ensure that you are present when the firewood is being delivered. This is because you will be able to ensure that your firewood is stacked appropriately and this way, you will be able to verify the size and volume of the firewood after it has been stacked. 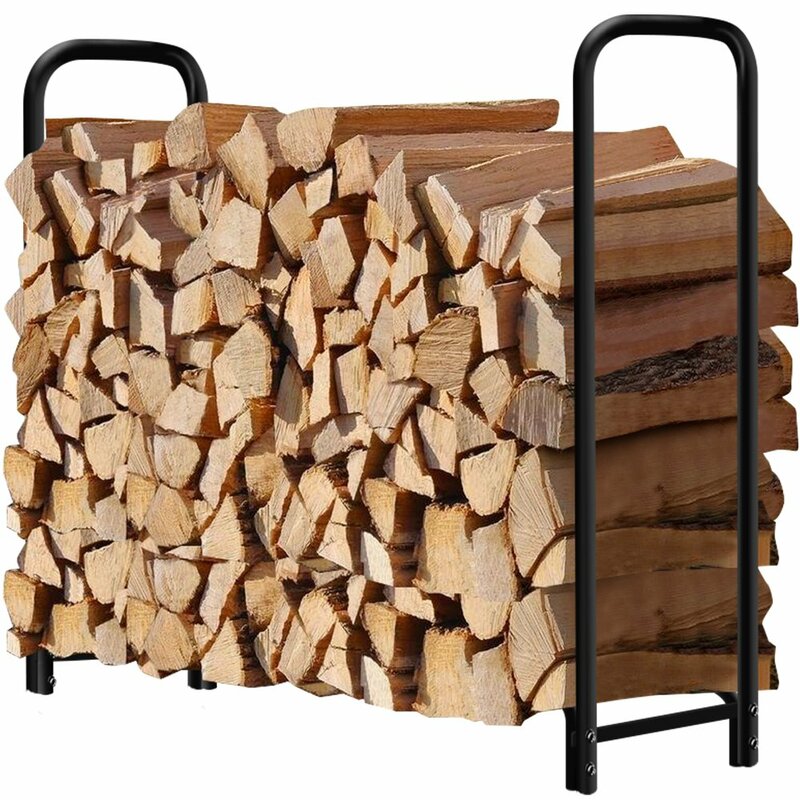 Some dishonest sellers can use tricks when stacking your firewood such that it occupies more volume or space than it actually weighs. .It is better to make the order physically so that you can inspect the type of wood, the quality of the wood and the volume of wood before making an order. Buying hardwood will actually save you more than buying softwoods. This is because hardwoods burn better and for longer because they have more energy and also produce more heat. You will need fewer cords of hardwood than you would require if you buy softwoods. This way, you will save more money. If possible, you should always avoid buying firewood that is measured in other units such as pick-up truck loads, stove cords and other terms that may not relate to the standard full cord. This is because they are usually hard to compare and may be used to hide a high price per cord measure.